Raising children is stressful – raising children with developmental difficulties can be more stressful still. The social worker is specially trained to work with both parents and their child. By helping parents reduce stress and improve their functioning within the family, the social worker maximizes the therapeutic potential of the care given at Achiya while reducing the child’s level of risk at home. A social worker assesses the psychosocial status of the family and helps families contact community resources and government agencies that can assist them in coping with the challenges of providing for a child with special needs. The social worker also assists in individual, family and group counseling to better equip parents to handle the stress that often comes with caring for a child with special needs. The social worker consults directly with Achiya’s staff therapists, giving them professional support and guidance, and participates in group conferences devoted to creating integrated treatment plans for individual children. When a child faces developmental or learning difficulties, true progress can only be achieved through partnership – between the professional therapists and teachers at the Center, and the parents at home. That is the philosophy behind Achiya’s toy lending libraries, which allow parents access to educational resources and activities for a minimum fee. Situated in Achiya’s Developmental Centers, the toy lending libraries offer parents and children a range of toys and games they can borrow and take home. These resources reinforce the skills learned in therapy, while giving parents – many of whom cannot afford to buy toys for their families – the opportunity to bond positively with their children through enjoyable, home-based activities. 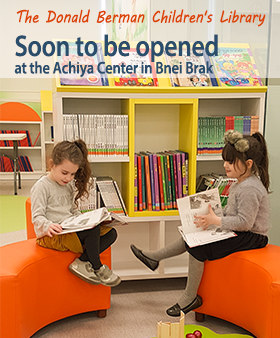 The Toy-Lending Libraries at the Elad and Bnei Brak Developmental Centers were founded through the support of the Helen Bader and Donald Berman Foundations, respectively. Goal: To provide a first response to pressing issues, including educational and domestic issues. Impact: The Achiya Counseling Hot Line responds to approximately 70 phone calls per month. Of these 70 phone calls, some 10 are sufficiently complicated to require a personal meeting with our staff counselor. In addition each month the hot line receives several requests for guidance from teachers and/or schools in dealing with complicated issues. Partners: This program is completely subsidized by Achiya – Learn That You Can, and is presently looking for partners. Parents are the most important influence on every child. At Achiya, parents are full partners in the therapeutic process. Achiya offers regular workshops for parents who seek a better understanding of the challenges their children face. These workshops help parents adopt strategies that will help children succeed both in the home, and in the classroom environment. Teaching is a dynamic profession. Teachers find it increasingly difficult to contend with the new challenges that arise every day. Many practicing male teachers in the Haredi educational framework have no formal teacher training. We know that every teacher must have a “box of tools” at his disposal to use in his work with children in the classroom. Therefore, besides Achiya’s thriving Teacher Training Centers throughout Israel, Achiya holds workshops for on-the-job teachers in each of its outreach programs. Through the series of monthly workshops held during the 3 years of each program, teachers get knowledge of different aspects of child development and obtain practical tools, learning how to use them in the classroom. In order to reach a much wider audience of teachers, Achiya holds evening lectures for the wider public on child development and education.